Alright, I want to try something and we'll see if it turns into something fun! Someone (me first, sorry but I'm starting it so that's how it works) puts up a challenge for a photo and everyone else gets some time to put one up and then someone else gets to toss out a theme or challenge for the next one! This might be sloppy but let's try it and see if it works! We're starting with ice creams because it's summer! Let's see an ice cream from your part of the globe and tell us what it is! May I present, the Hilda. I like to call her Angry Hilda for obvious reasons. I don't know why she looks so angry though because she's a strawberry icecream covered in colorful sprinkles! 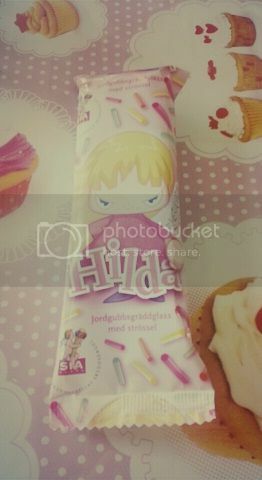 There seems to be a set of icecreams with names and little kid cartoons on them but I think Hilda is the most common... I think... Anywho, it was good!